NOTICE: Requires the base game Syberia 3 in order to play. Activation key must be used on a valid Steam account. Requires internet connection. About the gameIncludes new mission An Automaton with a PlanDiscover An Automaton with a Plan, a new adventure that takes place in the enchanted world of Syberia 3! Play as Oscar, the famous automat, and unravel the mystery of Kate Walker's disappearanc… e! Oscar is far more than just a metal heart… He's also a sharp-witted detective and unwitting comedian who will surprise you at every turn! 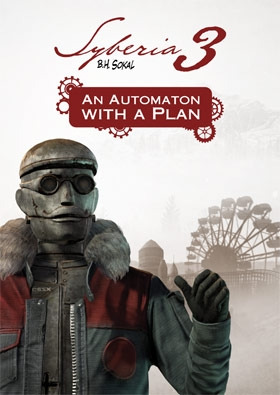 Enjoy a story full of suspense and humor in the world of Syberia 3, created and drawn by Benoit Sokal.Important notes: An Automaton with a Plan is downloadable content that includes an add-on adventure for the game Syberia 3.To access the content, select Downloadable Content in the main menu of Syberia 3. NOTE: the content in this adventure may contain spoilers for part of the main Syberia 3 game. System Requirements Windows - Minimum OS: Windows 7+ 64bit Processor: Intel Core i3 Memory: 4 GB RAM Graphics: AMD R7 260X - Nvidia GTX 550 Ti 2GB DirectX: Version 11 Storage: 45 GB available space Sound Card: Any	Windows - Recommended OS: Windows 7+ 64bit Processor: Intel Core i5 Memory: 8 GB RAM Graphics: Nvidia GTX 960 2 GB DirectX: Version 11 Storage: 45 GB available space Sound Card: Any Mac - Minimum OS: Mac OS X 10.8+ Processor: Intel Core i5 Memory: 6 GB RAM Graphics: AMD R7 260X - Nvidia GTX 550 Ti 2go Storage: 45 GB available space Sound Card: Any Mac - Recommended OS: Mac OS X 10.8+ Processor: Intel Core i5 Memory: 8 GB RAM Graphics: AMD R7 260X - Nvidia GTX 550 Ti 2go Storage: 45 GB available space Sound Card: Any ©2017 Anuman Interactive SA. All rights reserved. Developped by Microïds and Koalabs. Published by Anuman Interactive SA. Author and Artistic Director : Benoit Sokal. Microïds is a trademark of Anuman Interactive SA. All rights reserved.